Frugal Tractor Mom: The Hubby Gets His Toy Stuck! Few years before my Daddy passed away, he bought a new lawnmower. It's a Dixiechopper and it flies!! It will go way too faster than you need a lawnmower to go. The Dixiechopper cut Daddy's grass cutting time in half! Daddy would cut grass about everyday in the summer time. (We have about 6 acres of grass to cut between our house, my parents house and the rest of the Ponderosa!) What had especially drawn him to the Dixiechopper was the fact that it had a cup holder! Oh yes! It's the little things that men desire in their power toys!! Well, since my Daddy died, Hubby has assumed the grass cutting chore at the Ponderosa! Now he works full time (pretty much) and doesn't find the solace that Daddy did in the grass cutting. This means that the grass is lucky to get cut once a week! With all the rain we have had and still keep having, Hubby has found that he is constantly behind in the grass cutting department. The other day, when we were having friends over, Hubby was cutting the grass for the kids to play. (We were afraid they might get lost!) He was still cutting the grass when our friends arrived. As we sat down to chat, I realized that the lawnmower had quit. Hubby was no where to be found. What had happened? He was stuck!! 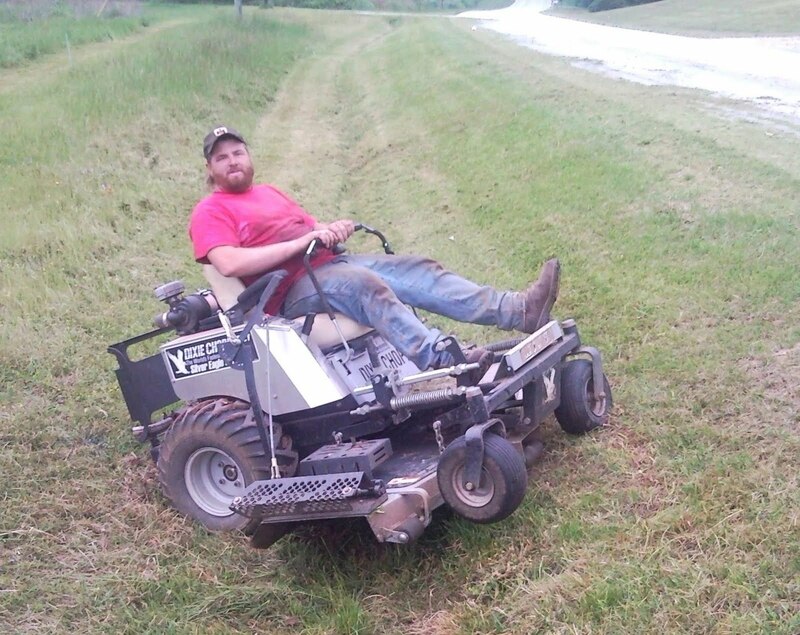 He had gotten the lawnmower stuck in the ditch by the road! The worst part (besides the fact that it takes two grown men to pick up the lawnmower to get it unstuck) is that this is NOT his first time! He does this AT LEAST twice a summer!! Maybe this will embarrass him enough that he wouldn't do it again! I ain't holding my breath!! Stopped by from SITS to say hi and welcome. Also, thanks for the link to the printable coupon site!